MaintSmart Software, Inc. announces the release of version 5.0 for: MaintSmart Enterprise, MaintSmart Cloud and MaintSmart Web module. MaintSmart CMMS Software version 5.0 is now available for virtually any device. Access equipment maintenance data through desktop computers, Citrix servers, web servers and portable devices such as laptop computers, iPad, tablet computers and smart phones. This system is accessible from virtually any device. Barcode capable work orders, preventive maintenance, inventory and personnel. 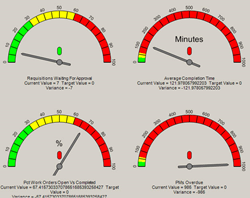 Dashboard KPI (key performance indicators) displays high priority information specific to each user. Language translations are available for any language. User has the option of adjusting or creating custom translations too. Enhanced automatic report generator sends reports and work assignments by email or to a printer. Simplified view on some common screens for new or inexperienced users of the system. This encourages all members of the organization to use the CMMS solution at some level. Enhanced inventory audit capability including cycle count audits. The aforementioned list is only a partial listing of the additions and improvements in the new CMMS software version. “We went to our user base for input on many of the major features in this software upgrade,” stated Daniel Cook, Vice President of Development. One of the predominant requests was to provide a simple input view for the work order and repair ticket screen. We accomplished this task by displaying only four fields in the simple input view mode. Additionally these four fields accept user default settings so that all the user needs to do is optionally type in a comment to describe the needed work. The goal is to get all members of the organization using the system at some level. With the new role-based permissions design it is possible to grant access to all potential users. This encourages use and increases accountability and timeliness of maintenance efforts. MaintSmart currently is in use in 41 countries. The trial version of the CMMS solution contains ten common language translations. We are pleased to provide language translations for any language. Software support is available in English, Arabic, Spanish, Chinese and Portuguese through or worldwide support network. Training is also available worldwide through online or onsite methods. Recently the Ministry of Electricity (MOE) received training in Amman, Jordan after a lengthy evaluation of the MaintSmart CMMS solution. The United States Department of Energy (DOE) sponsored and audited this training effort. Following this successful training of 40 Iraqi electrical engineers, the Deputy Assistant Secretary of the DOE commented: “Without your efforts DOE would not have been able to provide such successful training sessions.” MOE continues to successfully manage their preventive maintenance for 40 electrical power plants in Iraq with our software. Translations Provided for Any LanguageAbove translation depicts Arabic. Multi-Site, Multi-Language CMMS Software SolutionUp to 1000 different sites in any langauge or in multiple langauges. 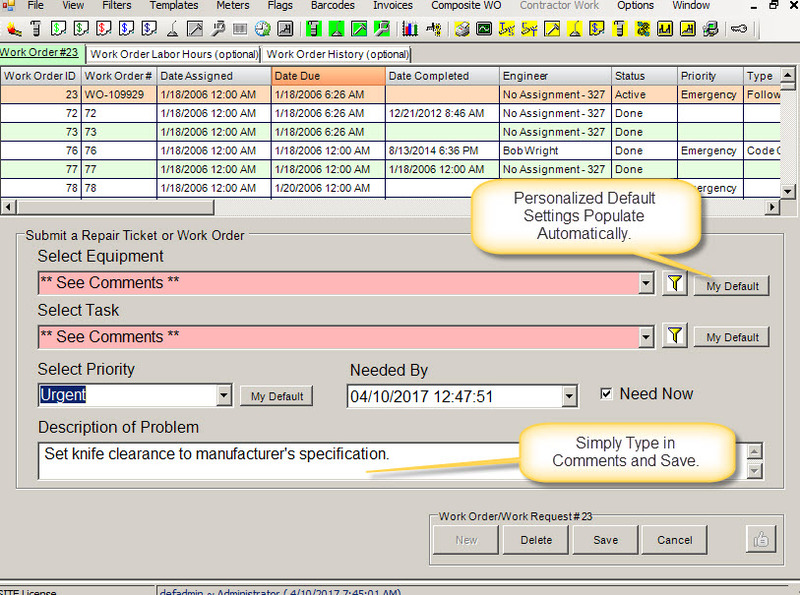 Simple Work Order/Repair Ticket Input ViewToggle between a very simple screen view or use the more comprehensive view that provides acces to all fields. Set the preferred view based upon the user profile. CMMS Dashboard Provides Drag and Drop Requisitions and Purchase OrdersThe new CMMS dashboard is customizable to each user. Drag and drop items into the shopping cart. Work orders, PMs, downtime, purchase requisitions and purchase orders.